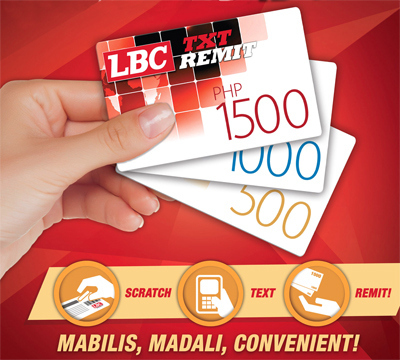 LBC TXT REMIT CARD is a new Prepaid Remittance Card service of LBC Express, Inc. that allows remitters/beneficiaries to send/receive money instantly anytime and anywhere in the Philippines via SMS. The remittance transfer is very easy and convenient! At the moment, there are 3 available card denominations: 500, 1000 and 1500. Here are the corresponding product codes and discount structure in the LoadCentral system. You may download the latest discount structure here. For more information on TXT Remit service, please visit www.lbcexpress.com.